How often do you show up when somebody makes a related search on your keywords? Your ads don’t always show in the same position on the page – why? – because Google like to test. They want to see what happens to your response rate when they move you from position 1 to pos 5 & vice versa. So it shouldn’t come as a shock to learn that your ads will almost never show up 100% of the time. Because Google like to test other advertisers’ ads too & see how they perform. It’s a myth that just because you’re bidding on a particular term that your ad will always be there. The metric you need to monitor to understand how often your ads show, is Impression Share. It’s just that, your share of the available impressions. Just because you don’t have total control over impression share, doesn’t mean you can’t improve it! And you want to improve impression share. Say you have a profitable Ad Group and you discover that your impression share is hovering around 30% – this is huge opportunity to increase your revenue. You just need to improve impression share. Before you can improve it, it would help if you could find your impression share. 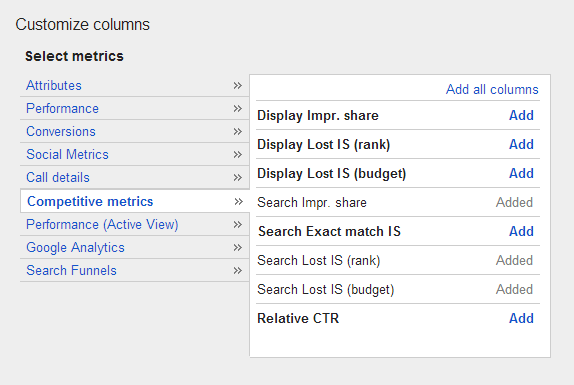 To take a broad look at a high-level, start on the “Campaigns” tab & then “Customize Columns”. You’re looking to select “Competitive Metrics” and from there ‘add’ Impression Share, Impression Share Lost to Budget, and IS lost to Rank columns to your data. You can do this at the AdGroup & Keyword level, although IS lost to budget will only be seen at the Campaign Level. You can look at Display impression share, but because of the massive size of the Google Display Network you’ll need an equally massive budget to get anywhere near 100%. So don’t worry about Impression Share for the GDN just yet. This is quite simply a percentage of how often your ads are showing up. If its 50% and you’re getting 1,000 impressions a day – you know that there are another 1,000 impressions you could go after if you improve your coverage! This column shows how many impressions your missing out on because of budget limitations. Simple scenario. Your daily budget is $100 and your Lost IS (Budget) is 90%, well that means you could spend another $900 a day to get full coverage. Another way to think of it » your budget is $100 and there’s $1000 worth of clicks available, your impression share won’t ever be more than 10%. (unless you up the budget). The larger this percentage, the bigger the problems you could have. Essentially Google feels your account isn’t of a high enough quality and will continue to limit your Impression Share. Once you know you’ve got room to grow your share, it’s time to do so! The best place to boost impressions – on the campaigns that are making you a profit! There are two factors that can limit your impressions. 1) Daily Budget and 2) Ad Rank. Address these limits and you’ll increase your impressions. 1 Daily Budget – Simple fix, provided you’ve got the budget. Simply increase your daily budget, but don’t forget to factor in profitability! Ad Extensions – use them, activate Site Links, Location and Calls at the bare minimum. *It’s better to have a low impression share and profit than a great impression share and a loss. Next – find out how to spy on your competitors Impression Share without 3rd party software!